At New York Bride & Groom, we take pride in being a full-service wedding salon. Ensuring that everyone in the wedding party looks as opulent and stunning as the bride is what we do. From designer bridesmaid dresses to the top tuxedo makers and every wedding accessory and alteration in between, NYB&G Raleigh has you covered for the Big Day. Can’t I Just Wear My Favorite Suit? Having a nice suit hanging in your closet is great, but don’t pull it our for your wedding. If you are a guest at a wedding, wear it with pride and feel dapper and dressed up. Many men on the guest list will be wearing their best suits as well. But if you’re the groom — the man who will be at the center of attention — you should look special. Besides, you can wear that same suit to work and feel all dapper and dressed up any other day of the year. Wear something that sets yourself and this day apart from the rest. 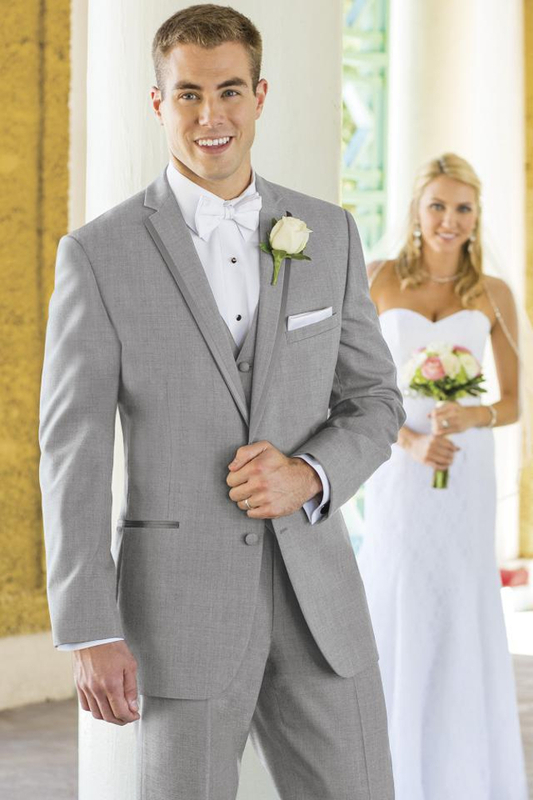 For a polished look, the Heather Grey Aspen tuxedo is a stylish choice. Tailored in 100% worsted wool with a slim fit styling, the Heather Grey Aspen’s contemporary notched lapels edged in satin add a touch of luxury to this fashion-forward style. Its light grey color makes it an inspired choice for outdoor weddings. If you want to go formal you need a bow tie. It’s really going to be your best look anyhow. The thinning power of vertical lines not withstanding, a bow tie is going to emphasize your manly physique as a whole. As mentioned by The Black Tie Guy in a recent blog post, one of the strongest elements of formal tradition is the starkly contrasted white “V” of the shirt against the black buttoned jacket. The wider top of the “V” accentuates and broadens the shoulders, while the narrow bottom creates the illusion of a thinner waist. The bow tie is integral in this illusion, as it draws attention to the wearer’s face. A long tie, however, dissects the formal “V” into smaller and more obscure sections that just don’t have the same effect. Long ties also direct attention away from the face and towards the naval. Sometimes, traditional black or white doesn’t cut it when it comes to the tuxedo. Feel free enough to try on other alternatives including navy or the luxurious chocolate shade seen below. Just as a woman’s skin tone can either glow or diminish with specific fabric shades, so can a man’s. Look for shades that enhance your coloring and make you look your best. 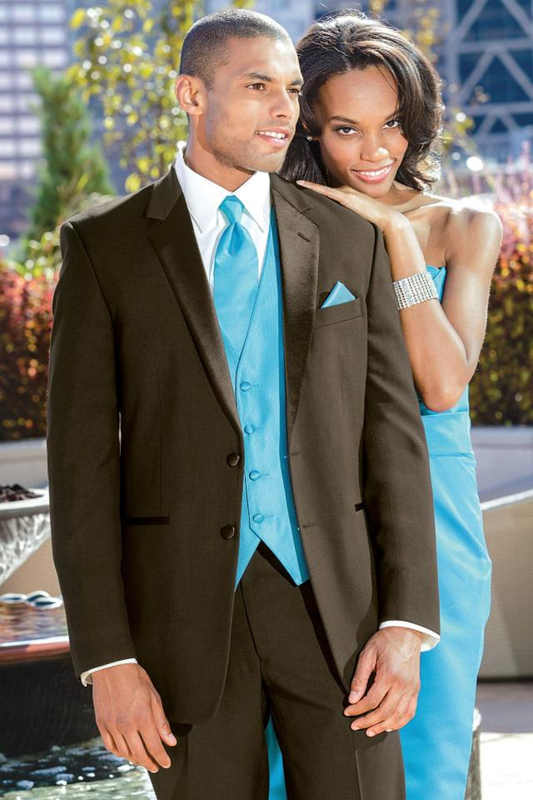 New York Bride & Groom has a dedicated tuxedo rental department that is sure to contain the perfect suit for every member of the groom’s party. Come browse at your convenience and find the perfect complement to your wedding colors and theme. Don’t forget: No appointment is needed, and with five tux rentals the groom’s tux is always provided free of charge.